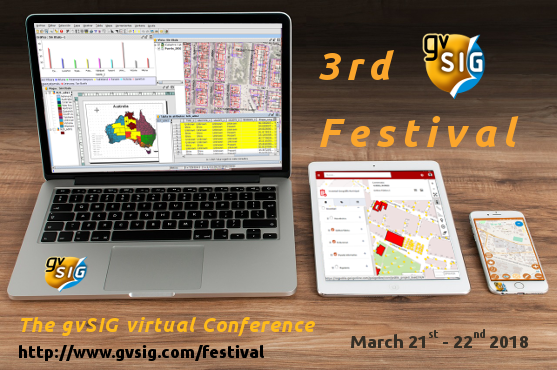 The third edition of the gvSIG Festival, the virtual conference about the gvSIG project, will be held in March 21st and 22nd 2018. Just like in the last edition, a period for sending proposals of projects about the application has been open, so that users that can’t present their projects in any of the existing face-to-face conferences can do it from their city. This event is free of charge and completely online, through the webinar service of the gvSIG Association, with the advantage to count with speakers from different countries and presentations in different languages, where users and developers from any part of the world can hold them. If you have done any project with gvSIG and you want to present it at the gvSIG Festival, you can send a summary to the following e-mail address: conference-contact@gvsig.com, explaining the project. The summary will have no more than 300 words, it has to be written in Spanish or English, and you have to indicate the title and the language of the presentation. Once the program is configured it will be published at the event website, and registrations will be opened. This entry was posted in community, english, events and tagged gvSIG Festival. Bookmark the permalink.